Last week, I pointed w(n)td readers to my Indiewire coverage of IDFA, including buzz titles and highlights from the Forum. With the festival now wrapped, having announced the winners of its 25th edition this weekend, its time to take a more indepth look at the titles in this year’s lineup I’ve had a chance to see. This post covers films from the various competitions, while the next will address non-competitive programming. While Alan Berliner’s FIRST COUSIN ONCE REMOVED took home the Best Feature-Length prize (a film I’ll include in a long-overdue NYFF roundup post soon), I found myself thinking about Emma Davie and Morag McKinnon’s entry the most of all the films in this competition. To expand briefly on my thoughts from my Iw article, the film offers intimate access to Neil Platt as he blogs about his terminal medical condition and tries to find a way to leave a posthumous impression of himself on his toddler. 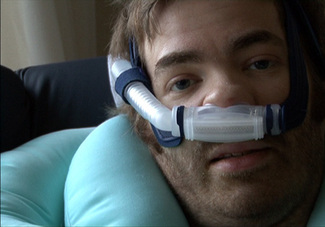 Left paralyzed by motor neuron disease in his final months of life, and requiring the assistance of his wife and others, plus an ever-audible ventilator, Platt serves as the film’s narrator, revealing a man fully facing his mortality as he races against the degeneration of his body to make sense of his short life. Always candid, and sometimes surprisingly funny, Davie and McKinnon’s film is touching, but never maudlin. Another title mentioned in my buzz article, Kesang Tseten’s film follows the rigorous selection process for the British Army Brigade of Gurkhas, a Nepalese contingent dating back over two centuries. Though thousands of young men try out for a coveted spot, there’s only room for a fraction of the 17-20-year-olds each year. Some wish to follow their fathers and grandfathers in the ranks, while others are motivated by more practical and economic concerns – the Gurkhas pay more than the Nepalese or Indian armies or, really, any other job they could likely secure. They also gain access to a British passport, something many find worth risking deployment to the Middle East to secure. Tseten’s observational film follows the young men through initial interviews, where officials screen out those who are likely lying about their age or motivation, as well as physical examinations and tests, comparing the latter with remarkably similar archival footage of their forefathers seeking the same opportunities. While a small handful of characters emerge, the true impact of the film comes in the spectacle of the largely undifferentiated group of youth, reduced to a number sported on their bare chests, each vying for the same position, a strange remnant of British colonialism. While the audience meets the women at the center of Juliet Lamont’s uplifting film after they’ve successfully won spots in a different kind of outfit – an all-girl band in Myanmar (Burma) – The Tiger Girls face no shortage of challenges. First, the shady producer who formed the group drops them. Then, he threatens them with a lawsuit if they continue performing under the name he created, forcing them to go with the punny “Me an Ma Girls” instead. Then there are the problems faced by the various Girls – bad dancing, controlling parents, tone deafness, hyperventilation fits, and ethnic prejudice. Even so, it would seem their biggest obstacle is living under a repressive military regime, but, surprisingly, the country starts to open up, releasing opposition leader Aung San Suu Kyi, and organizing free elections earlier this year. Against this backdrop, and with the help of their manager, choreographer, and mentor, the Australian Nikki, the group perseveres against stereotypes and start to make a name for themselves, even finding an opportunity to pursue a place on the international music stage. The Pink Panthers, the subjects of Havana Marking’s new film, have certainly made a name for themselves – among Interpol. They are among the most wanted criminals in the world, responsible for hundreds of millions of dollars in jewelry robberies, and have eluded capture since their debut in the early 1990s. Marking gains the cooperation of several past or current members to reveal some of their secrets in often fascinating interviews, with their identities protected via animation and by employing actors to perform their dialogue. With origins in a war-torn post-Soviet Yugoslavia with few options, the Pink Panthers turned to crime, functioning for some in the Balkans as Robin Hoods of sorts – stealing from wealthier countries and contributing to the economies of Serbia and Montenegro with their ill-gotten gains. As the Panthers walk the viewer through their planning and execution of heists – noting the key role female operatives play in casing jewelry stores – Marking employs occasional footage of their daring robberies caught on surveillance cameras. While the film might drag a little bit, it’s largely successful at capturing a sense of excitement in the illicit activities of the group, and reveals genuine surprises in their backstory. Nadav Schirman also tackles a criminal’s background in this final title in IDFA’s main competition. Although the film is technically about Magdalena Kopp and her daughter Rosa, in many ways its true subject is the figure who haunts them both, Magdalena’s ex-husband and Rosa’s father, Ilich Ramirez Sanchez, otherwise known as Carlos the Jackal, the infamous terrorist/revolutionary. Speaking openly about her past involvement in the Frankfurt Revolutionary Cells, Magdalena reveals how she met and eventually partnered with the Venezuelan and his bombings on behalf of Palestinian causes in the 1970s and ’80s, eventually ending up in prison for several years. After her release, she relocated to Syria, reuniting with and marrying Carlos, and giving birth to Rosa, though the family had to separate when it proved difficult to find a country that would harbor Carlos. For her part, Rosa grew up learning about her father through her mother and the media. When an opportunity comes to visit him in Paris as he stands trial, Rosa faces the truth behind the legend, and finds the experience disappointing. Schirman does an admirable job eliciting candor from his subjects, but there’s a lack of energy to the proceedings that weigh the film down somewhat. Moving over to the Mid-Length competition, Lida Chan and Guillaume Suon’s portrait of a woman reckoning with her past under the Khmer Rouge was declared the winner. Like thousands of her countrywomen, Sochan Pen was forced into a marriage with a Khmer Rogue soldier at the age of sixteen as part of the regime’s social engineering policies. More than three decades later, Sochan speaks out about her experience, filing a complaint, and seeking answers about who sent her to her fate those many years ago. Sochan’s story is poignant, standing in for the millions of Cambodians whose lives were lost or otherwise shattered by the injustices perpetrated on them. While on one level addressing a social issue – the impact of lack of power on education – Eva Weber’s new film finds its strength in the power of the image over the message. Set in Guinea, where power is scarce, students are forced to turn unorthodox yet lit locations like airports and gas stations into nightly study halls. In the absence of these unusual communal gatherings, these young Guineans would have no opportunity to study at night, and their chances of escaping poverty would vanish. Weber captures their efforts to secure their futures in beautiful nighttime tableaux – hundreds of young people huddled underneath sources of light, studying their textbooks in an almost reverent congregation. I missed the winner of the First Appearance competition, SOLDIER ON THE ROOF, but I did see quite a few from this section, including Qi Zhao’s standout meditation on the aftermath of the devastating 2008 Sichuan earthquake. Focusing on the mountain city Beichuan, which suffered 20,000 casualties, the film reveals the story of three families facing the loss of their loved ones and of their home, even as the government speeds construction on a replacement city nearby. In the face of the unthinkable loss of their young daughter, Mr Peng and his wife won’t even think of having another child. Mrs Li, a divorced middle-aged woman, can only find meaning in her bureaucratic job and tending to her paralyzed mother. Teenage Hong feels distanced from his mother as he copes with his father’s death. Together, these subjects, dislocated from their families and from Beichuan, struggle to reclaim their lives and a sense of security without letting go of their memories of the past. Alex Meillier reveals East Timor’s struggle for independence through the story of Australian journalist Kirsty Sword, who became an instrumental yet clandestine figure in the Timorese resistance to Indonesian occupation. In the 1990s, operating under the titular code name, Sword smuggled technology and messages between the resistance and their imprisoned leader, Xanana Gusmão, developing a deep relationship that eventually blossomed into a romance. Their combined efforts helped keep the heat on the Indonesian regime, and, after the East Timorese united with the Indonesian pro-democracy movement, they found victory. After his release from prison, Xanana pushed for non-violent resistance as his people sought independence, and he was eventually elected President, and later Prime Minister, of the independent democratic state of East Timor. Meillier’s film is solid as a whole, but, despite the title, Sword doesn’t maintain a centrality in the narrative. It very much becomes a story about Xanana for the second half of the film, with Sword relegated to the periphery. That said, the film works as a intimate, first-hand account of the efforts of an occupied people and their supporters to secure their liberty. 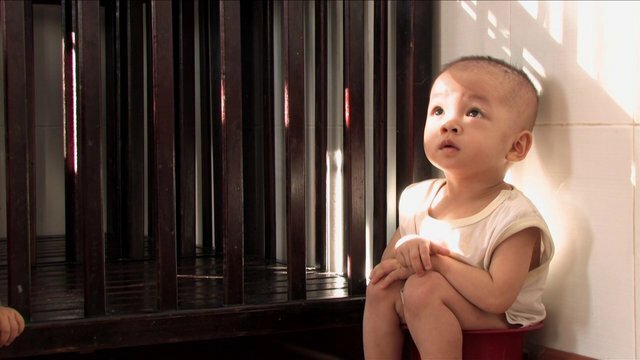 Often very difficult to watch, Jakeb Anhvu’s film is a disturbing exposé of abuses at a Vietnamese orphanage. Founded and run by Tong Phuoc Phuc, an apparent humanitarian who has been honored by the government, the orphanage regularly receives donations, but the talk around the neighborhood suggests that Tong’s not entirely on the up and up. An extreme pro-lifer, he builds a cemetery for aborted fetuses, and convinces women to carry their unwanted pregnancies to term, adding to his orphanage. Critics allege that he’s become greedy, amassing a personal wealth from donations for the children, and using those funds to purchase cars and homes rather than tend to the toddlers. Anhvu’s camera, meanwhile, experiences the difficult life the latter lead at the orphanage – barely tended to by miserable, catty, and pregnant young caregivers, the children are berated and beaten, except when visitors drop in to see the “good work” being done there. According to Anhvu’s Q&A, the abuse caught on camera was just the tip of the iceberg – he would interrupt his shoot and try to force the women to stop hitting the kids, but they would just resume again, while calls to the police would yield no results. Like ALBINO UNITED, which played at IDFA two years ago, Harry Freeland’s film confronts the superstition and violence facing albino Tanzanians. The newer film profiles two albinos, one an advocate speaking out against the murders of albinos for the black market in their body parts, and the other a student unable to continue his education because of the stigma associated with his condition. Josephat, disturbed by recent murders against albinos, travels around the country to counteract the violence incited by witch doctors claiming albino limbs are possessed of magic. Verdastus is a bright teenager with a knack for electronics whose own father wanted him killed at birth. Because of threats to his safety, he seeks admittance to a special albino school, but there’s no room for him. When he meets Josephat, another option is found. Both of the characters are able to sustain viewer interest, but the basic problem persists that this topic, though clearly serious and still an issue, has been covered before. A similar complaint could be leveled at Jordan Melamed’s film about the Chicago Mercantile Exchange – there have been several documentaries in the past few years taking a wistful look at the end of the trading floor due to the computerization of the process. What should make Melamed’s project unique is the presence of his father, Leo, the Chairman Emeritus of the CME, who could perhaps offer a long-range perspective of the past and potential future of the markets. Unfortunately, the filmmaker – himself a fifteen year veteran of the pit before he pursued a career in film – instead uses his film to explore interpersonal issues with his father, and otherwise spends an inordinate amount of time on the trading floor documenting soon-to-be outdated hand signals and other not particularly interesting aspects of the pit. As a result, the doc feels schizophrenic – too personal to effectively explore the changes to the CME, and too distracted by the archaic mechanics of the pit to succeed as a personal meditation on the filmmaker’s supposed lost legacy. Another film in the First Appearance competition that doesn’t quite work is Gerard-Jan Claes and Olivia Rochette’s behind-the-scenes look at the Paris Opera Ballet’s attempts to learn a particularly challenging choreography. The camera observes the dancers as they are schooled in the titular piece, originally conceived in 2001 by Belgian Anne Teresa De Keersmaeker, with the latter and the original cast overseeing the rehearsals. These sequences are often quite beautiful, but then they are contrasted with deliberately poor-looking surveillance footage, random audio exchanges, and clouds. The effect is both frustrating and baffling, and, at least for me, doesn’t come together in a satisfying manner, despite the clear filmmaking talent that is sometimes on display in this non-traditional dance doc. 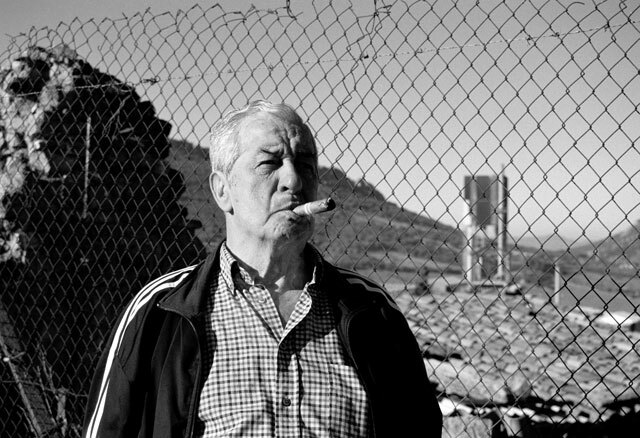 Much more successful is the winner of IDFA’s Student competition, Chico Pereira’s accomplished study of a Spanish 70-something curmudgeon. Shot in luscious black and white, the film revels in everyday moments with Pablo – a visit to the doctor, who urges him to quit smoking, especially after several heart attacks; playing cards with his friends, who slyly try to make him smoke; being talked into dancing with his faux-suffering wife; and teaching his grandson how to ride a bike. He’s undoubtedly a grouch, but a lovable one – the fact that he’s taking part in Pereira’s project speaks to an openness about Pablo that’s unstated. Expertly paced scenes unfold effortlessly in front of the camera, almost as if they were scripted, perfectly capturing the protagonist and his environment, making for a memorable character portrait and suggesting Pereira has a promising future ahead as a documentary storyteller. The only film I watched in whole in IDFA’s Dutch competition was Deborah van Dam’s investigation into the early life of a Jewish woman, saved as a baby during the Nazi occupation of the Netherlands in WWII. As signaled by the title, an apparent point of interest here is that the subject, Anneke, was the baby appearing in a couple of photos with Anne Frank, and briefly mentioned in her diary, but, frankly, this isn’t particularly interesting and functions as barely a footnote. Anneke, for her part, never really felt like exploring her past, but is spurred on by her “war brother,” a member of the family that initially provided her safe harbor who gets in touch with her. Reluctantly traveling from New York to visit him, despite having only one negative memory of her time with his family, she is also urged to provide testimony to posthumously honor his parents as the Righteous Among the Nations. As she searches for more information about her early life, she learns of disturbing facts that help explain her ambivalence. Unfortunately, despite these late revelations, the emotionally detached and unpleasant Anneke generally makes for a poor subject for the majority of the film and does little to engender sympathy from the audience, ultimately making this a miss for me.